Features 85 locations, including nine completely new sites. 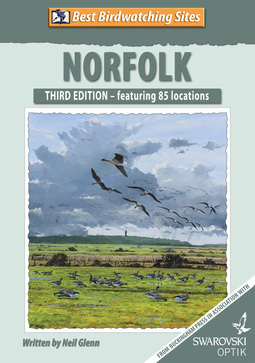 With the ground-breaking First Edition of his Norfolk guide in 2002, author Neil Glenn set the benchmark for providing essential information needed by birdwatchers to make every outing a success. When combined with Hilary Cromack’s detailed maps and attractive lay-outs, it created a formula that has not been surpassed. For this exciting Third Edition, Neil has re-evaluated every site, so the information is bang up to date and he’s even managed to find nine sites that have never been covered in print before. · Up-to-date information on 85 locations, including many little-known gems away from the coast. · Practical birding tips for each site. · Detailed maps and access information. · The latest bird information for each site. · All sites evaluated for wheelchair access. · Valuable background information for newcomers to the Norfolk birding scene. · Target birds for each site – and how likely you are to see them. · What birds to expect – month by month. · Advice on reaching sites by public transport.